I am honestly bewildered by the plethora of articles about concealed carry in the summertime and how you if you want to carry when the weather is hot you have to get one of those little mouse guns or pocket guns. Yeah, yeah, yeah, the first rule of a gunfight is to have a gun. Right. To me that sounds like the first rule of winning a boxing match is getting in the ring. But a 100 pound woman with no training getting into the ring with a heavyweight champion boxer is not going to win. Likewise, an untrained, civilian with a pocket .380 is not going to win in an altercation with a hardened criminal on drugs armed with a .45 caliber handgun. Honestly, folks, it’s not hard to carry a decent size and caliber handgun, no matter the season. Wear shorts. Just wear shorts with belt loops. Wear a short-sleeve, lightweight shirt. But get shirts with a pattern to them, preferably in colors other than white. If you’ll do that and follow the suggestions I’ve made in earlier blogs and which I’ll repeat here, you can be well-armed regardless of the season. A gun at your belt does not care how long the pants legs are. A gun covered by a shirt tail does not care how long the sleeves are. Yesterday I watched a family go into a restaurant. Dad, mom and boy of about 12. Dad was armed. How do I know? Well, I don’t know for sure, but he was wearing cargo shorts with a big bulge in one of his thigh pockets. “He’s got a gun in that pocket,” I thought when I watched them walk. He even looked like a gun guy. My next thought was, “where is he going to find a bad guy who will wait for him to unzip that pocket and pull his little gun out, orient it and get it pointed in the right direction?” My very next thought was that the clothing he was wearing would have been just as conducive to carrying a .45 Springfield Operator 1911 as the clothes I was wearing. His shirt was white, but it was a tactical-type shirt, with a long shirttail worn outside his pants. His shorts were khaki, 5.11-style shorts. Those shorts have belt loops. His combination of clothing would carry and conceal in the same way mine does. The image on the right is a cutaway showing where the gun is in the image to the left. Notice this is not a big guy. THE SEASON DOES NOT MATTER WHEN IT COMES TO DEFENDING YOURSELF AND YOUR LOVED ONES. Once again, here’s how a guy can carry a big gun. A guy that weighs 130 pounds or a guy that weighs 300 pounds. This method works for both. Buy a good gun belt. It can be a 1 1/4 to 1 3/4 inch wide, two layers thick, leather gun belt or a 5.11 Tactical Sierra Bravo Duty belt. It just needs to have enough thickness to support the clips from the holster and to support the weight of the firearm. Get a good IWB holster, custom made for your gun. I’ve used Crossbreed SuperTuck, WhiteHat Holsters, D.M. Bullard Leather, Alien Gear, Galco KingTuk, and MTR Custom Leather holsters. They all work well. Find the best position on your body for comfort and accessibility. 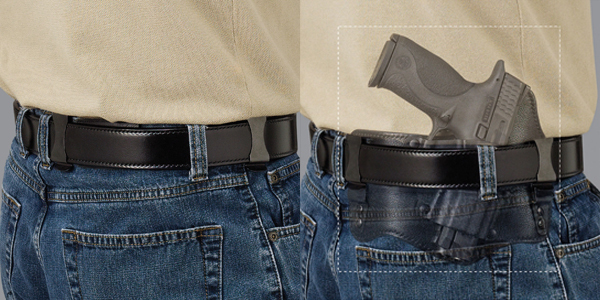 Most of the holster manufacturers recommend the 4:00 position. For me 3:00 works best for semi-automatics and for some reason 11:00 in a cross draw position for revolvers. That’s commonly called appendix carry. Unload your gun and practice drawing until you can do it smoothly over and over. Don’t worry about speed, worry about smoothness. The speed will come with practice. Break your practice down into steps: a) uncover, b) grip, c) draw, d) rotate, e) join hands and extend. Do this over and over until it becomes muscle memory. Now, you may actually have a chance should you encounter an unpleasant situation where someone wants what you have and is willing to kill you for it, regardless of the season or length and weight of your cover clothing. I agree. It’s not hard at all to conceal a full size gun, even in the summer. I’m 5’10” 180 lbs and carry a full size XDm with 4.5 inch barrel. Shorts with a waist that is slightly larger than I need, a GOOD belt and holster, and a short sleeved button down shirt 1 size larger than I need is what I wear. As mentioned in the article, make sure the shirt has patterns or multiple colors to help break up any printing that may occur. No one ever notices and I don’t have to go through this nonsense of switching guns simply because the temperature has changed. Don’t wear skin tight clothing and you won’t have a problem. Thanks, Dave. Maybe we can convince others they can carry a real gun regardless of the weather!